Today I have a kitchen that's done in one of my favourite styles. 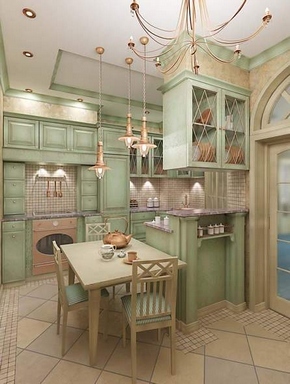 This "french country style" interior is a sophisticated combination of peacefullness, softness, and richness. Look how refined its color palette is! And also notice how charming are the bronze-colored metal light fixtures and furniture elements. There was definitely a lot of talent applied to this room.